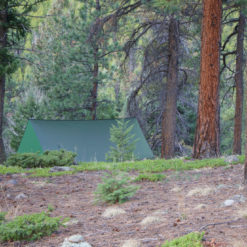 The Cloudburst is a large, all around 3-season tarp that can be paired with any of our hammock models. 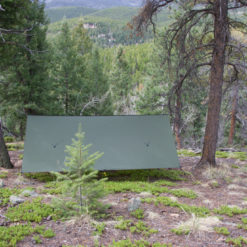 The CB is an 11’x10′ rectangle specially designed as a solid 3 season tarp for the Ridgerunner hammock, it’s panel pulls are spaced farther apart and lower to correspond to the spreader bars of the RR. Unlike the MJ and Superfly, it features straight cut sides (the ridge seam still has the same very slight curve cut). I recently purchased the ridgerunner, bushwack camo cloudburst and bushwack camo lynx full winter UQ. 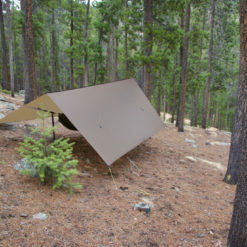 I like how it looks, it’s lighter than my old tarp and keeps me and my gear dry, what more can you ask ? To help my wife feel more comfortable in the forest, I needed to cover both hammocks with one tarp. The Cloudburst does the job well. The panel pulls really help make more space inside when trying to pitch it low to keep the weather out. No problems with the Cloudburst or the Blackbird DL1.7 since I bought them in about 2011. Great quality gear. I used the 30d nylon cloud burst over the Blackbird xlc in heavy rain with no issue’s. keep me dry in my Hammock and also kept my chair, pack and cooler out of the rain. Rained for 2 days heavy rain and kept me dry. Great quality tarp, had tightly anchored down and all tie points held up perfectly. Love this tarp, will purchase another. Warbonnet is the best. 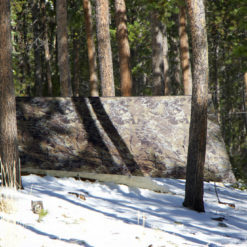 I have the Blackbird, Ridgerunner, top and underquilts along with two tarps, one of them being the cloudburst. 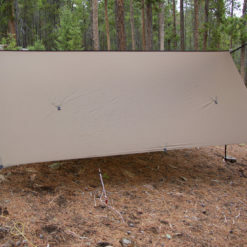 The cloudburst is a wide tarp which the ridgerunner needs for spreader bars. The tarp is light and super well made. When it comes to hammock, tarps and quilts, I go nowhere else. 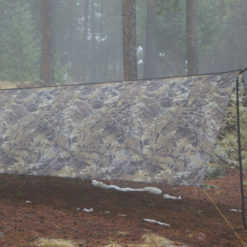 This Cloudburst tarp is truly outstanding. I took it to Grandfather Mountain in North Carolina in late August 2016. This is very rugged terrain. On the Daniel Boone Scout trail on our way down at about 3500 feet elevation we camped the second night. As we established camp at around 7pm it poured the rain on us. 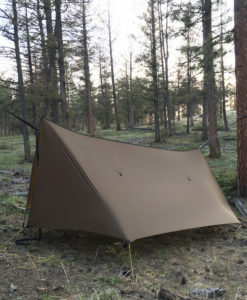 I secured the tarp using 1/8 inch guyline at about 6 foot runs and 6 separate pieces (all 4 corners of the tarp and the center roofline on both sides). To tighten each of the guylines around the various trees, or limbs, or aluminum stakes, I used 6 red KINGLAKE Aluminum Guyline Cord Adjusters (the type with a hook on one side and closed loop on the other). 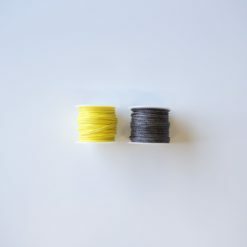 These small lightweight adjusters are great for tightening each guyline nice and snug without slippage (saves having to tie knots in order to tighten down the guylines and can also be easily loosened). Once the tarp was up and secured at all 6 anchor points, I had a large dry area to work under so that I could then put up my RidgeRunner hammock. That night, from around 7pm to midnight, it poured the rain. The Cloudburst never leaked. Then about 1am to 7am freight train sounding wind bursts started coming down from the top of the mountain coming down towards our camp striking and shaking our tarps violently about every 60 seconds or so. The wind was so strong it was causing my hammock to actually swing about 1 foot to either side during this 15-20 second bursts. The side blowing rain spray was really bad the entire night but the Ridgeline hammock combined with the wide sides of the Cloudburst allowed me to stay fairly dry. Note: everything in this kind of harsh weather will get a little damp no matter what you do. But again, the Cloudburst did an outstanding job to both stop the wind coming in from the sides as well as stopping the deluge of rain coming down through out the night. I was amazed the tarp did not leak or rip in the face of the wild violent wind whipping it all over. The next morning during pack-out, I had to stuff the Cloudburst back in its stuff sack while it was still soaking wet. This is challenging for 1 person as you stuff the tarp into the stuff-sack it keeps trying to come back out of the bag (same in dry conditions, just worse when wet). Once I got all the equipment home after this damp weekend I opened it all up and laid it out in my hot garage, and everything including the tarp pretty much dried out within 12 hours. The rollup stuff-sack size of the CloudBurst is roughly 4 inches diameter by 8 inches long (this includes getting the 6 guylines and 6 KINGLAKE Aluminum adjusters in the bag as well). 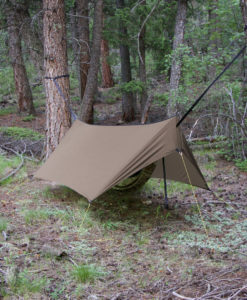 Based on the deployed width of the RidgeRunner Hammock and need for some side to side sway for the hammock, this is the perfect companion tarp for the RidgeRunner. I will never leave home without this piece of equipment. 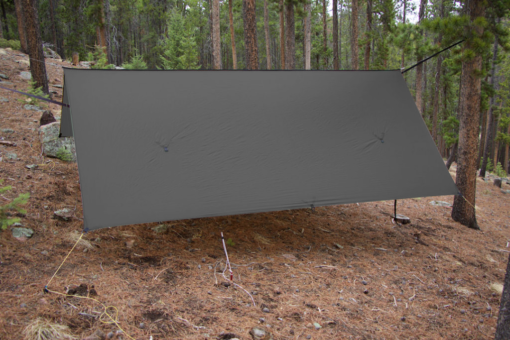 I have a previous review for this tarp but have to add a little more. Used it to cover two hammocks at the same time on a recent trip. During the night an unexpected thunderstorm blew up that ended with some strong straight line winds. The winds blew several mature live trees down 40/60 yards from where we set up. Cloudburst held strong and we stayed dry as a bone. Haven’t had the opportunity to deploy the CB yet. I opened and hung it just to seal the seams so far. I was impressed with it, however. I will try it out in mid Nov. during a hunting trip. Will give you a better review on its performance. So, I just recently received this, having come from using a Superfly. I changed hammocks from a WBBB to a WBRR, changed insulation, going from a pad in the hammock and a sleeping bag, to a UQ/TQ combo, and said, what the hey, lets change tarps too! I set this up for a trial run in the woods behind my house. That night, as I lay in the hammock, I experienced a cloudburst. How appropriate, right? We had been having T storms over the last couple days. This one wasnt scheduled, but I set the tarp up anyway. Glad I did! The tarp performed flawlessly. There was plenty of room in the tarp. I pitched it in porch mode, low, as thats normally how I pitch it when I stay out. No leaks, no need for the doors. I had some initial concern, as I was used to buttoning down with the doors in the event of storms. But, no blown rain came in. There is plenty of space between the edge of the tarp and the hammock, and, with the tie outs properly tied out, there is plenty of side to side space for a bridge hammock. I would definitely recommend this product! Very nice easy to setup tarp. Seams seem very strong and well stitched. Fits the ridgerunner hammock very nice with the pullouts in the correct locations. It’s easy to see that the cb is made for the ridgerunner, it fits it like a glove. I’ve owned the superfly and the cloudburst and the cb is better suited for the ridgerunner. 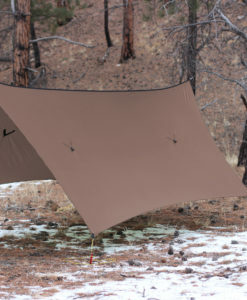 If there is any ridgerunner (or other bridge style hammocks) owners looking for the perfect tarp is this one. Imo. once i setup my RR hammock, i setup the tarp. it was easy after watching the videos posted on the site on how to do it. it even rained for 2 of the 3 days I had it up. the first rain was pretty heavy and I had not seam sealed it. I would HIGHLY recommend you seam seal this thing good before you take it out on the trail. Plenty of room under this thing! lightweight and durable. I needed a second tarp because I have a friend coming in for a trip. I find that when you are trying to get new people hooked it helps to have additional gear for them to use. 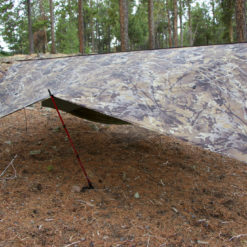 (Well that’s the excuse I tell myself) I got the Cloudburst to go with my Ridgerunner and I will have my buddy use my old tarp and the Blackbird. The Cloudburst is very well made and set up perfectly for the RR. I also needed it quickly due to the trip being close and Brandon easily came through in just a few days when I told him about it. Great Products, Great Customer Service and He’s one of us. Why would a person go anywhere else to get their gear. Purchased the cloudburst and spent five nights on the AT. Had rain on three nights of the trip, battled hard wind almost every night. One night was very very stormy with loads of wind and rain. Slept dry every night. Last night of the trip was extremely cold and windy so I set up under a ridge with the tarp low to the ground. Never felt the first breeze. Great product, well made, it will lay with you when the going gets tough.. I didn’t waste any time using the tarp. The day after it was delivered, off I went to Yosemite for a test, knowing that it was going to rain/snow all night into the next day. The tarp worked flawlessly, keeping me dry and happy.